Try our Green Glue measurement calculator! Our most popular and cost effective product, Green Glue Noiseproofing Compound, is a unique sound damping product ideal for new construction or renovation projects. This compound's unique properties absorb vibrations as they travel through ceilings, walls and floors, preventing noise from entering one's dwellings. Green Glue Noiseproofing Compound is applied between two or more sheets of commonly specified building materials such as drywall, plywood, and OSB, to reduce the amount of sound transmission between two rooms. Typical applications are for wall, floor, and ceiling assemblies to reduce airborne and impact noise. Green Glue Noiseproofing Compound is non-hazardous and environmentally-responsible. It’s a cost-effective solution that gives you peace of mind—literally, while adding value to your home or commercial space and contributing to the energy efficiency of the building. 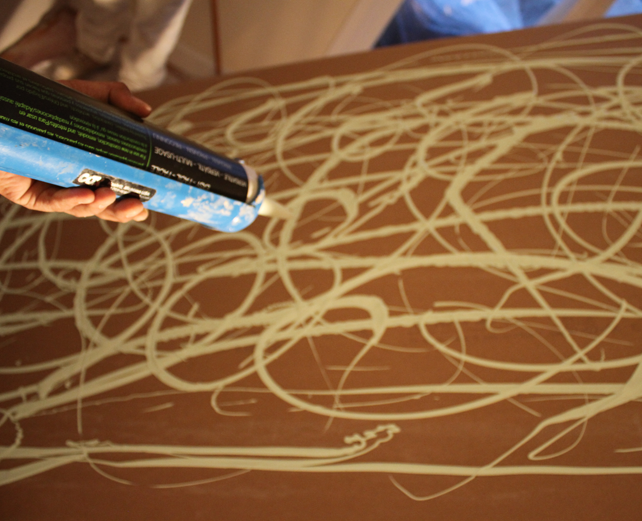 Applying Green Glue Noiseproofing Compound by the tube is fast and easy. Rather than a notched trowel or Green Glue Dispensing Gun all you need is a regular caulking gun to dispense the Green Glue compound. Green Glue is a constrained layer damping system, in other words, a damping material that is sandwiched between two rigid layers, such as drywall. Sound damping occurs as the viscoelastic center of the "sandwich" is sheared by sound vibrations traveling through the rigid layers. As sound vibrations stretch and pull on the damping material, Green Glue works by efficiently converting and dissipating the mechanical vibration energy into heat, effectively eliminating the noise. Green Glue is the simplest, most effective and most affordable soundproofing product for your floors, walls, and ceilings. Green Glue is non-toxic, virtually odorless once dried, and has ultra low VOC's. 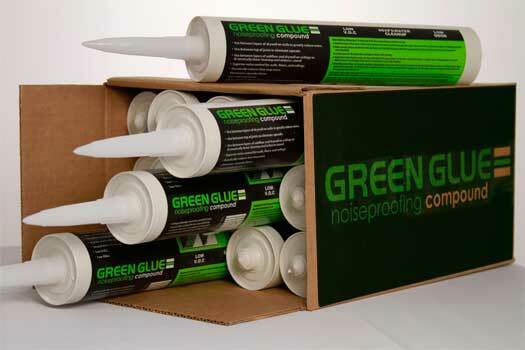 Independent lab tests prove that using Green Glue Noiseproofing Compound dissipates up to 90 percent of noise. Green Glue is effective at reducing both impact and airborne noise. Unlike other soundproofing products, Green Glue Noiseproofing Compound is ideal for dissipating low frequency noise common with home entertainment and theater systems. Ideal for home theaters, recording studios, playrooms; wood, tile and carpet floors; anywhere you want some peace and quiet! • No measuring or troweling. • Green Glue dispenses with very little effort. • Application time is about 20-30 seconds per tube. • Complete coverage is not necessary to obtain excellent results. • While wet, Green Glue is easily cleaned with soap and water. • Clean dried Green Glue with Goof Off remover. • Green Glue has a slight odor while wet. 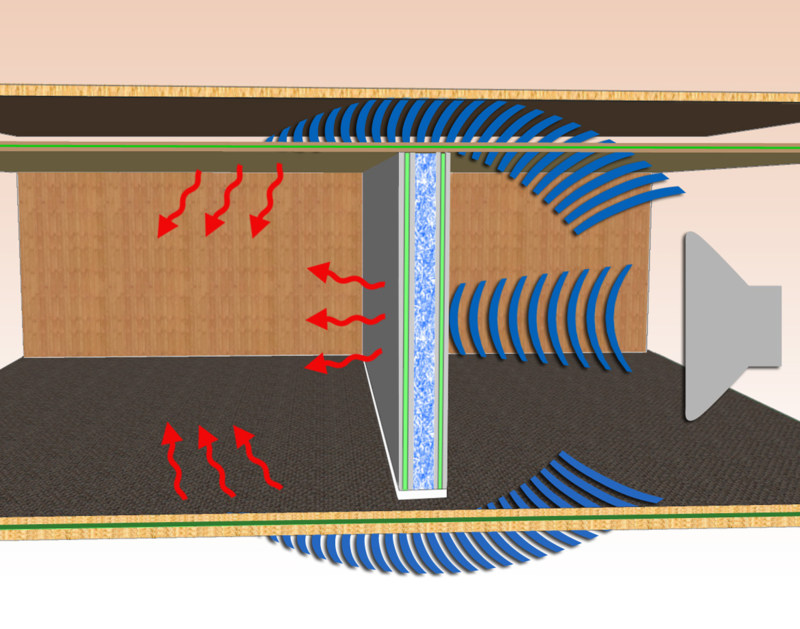 Ventilate the room to reduce odor. • Must be used between two rigid layers; one layer must be porous; e.g. drywall, plywood, OSB. Hang the first layer of drywall according to local building code requirements. After hanging the first layer of drywall, it is recommended that you seal the seams between sheets. This can be done with either acoustical sealant or drywall mud. Take care that any mud or sealant used to seal the seams is flat. Make sure to keep a 1/4" gap around the drywall perimeter and fill this gap with acoustical sealant. Secure the Green Glue tube in the caulking gun. Cut the plastic tip at the end of the Green Glue tube with a utility knife to create a 1/8" to 3/8" opening. Screw on a separate nozzle and cut the end leaving an opening of 3/8” or more. Place second layer sheets of drywall on a clean, flat surface. Apply Green Glue to the back of the second sheet of drywall. Apply the glue in large beads in a random pattern across the entire board. Leave a 2"-3" border free of Green Glue around the edge of the board. This will allow for handling the board without getting Green Glue on your hands. It is possible to empty a tube in less than 30 seconds. Use 2 to 3 tubes of Green Glue per 4' by 8' sheet of drywall. 3 tubes are required for higher performance solutions. Make sure to use the recommended amount of Green Glue for your desired results. After applying Green Glue to the back of the second layer, raise the board into position, press the board against the wall or ceiling, and fasten in place using appropriate screws. Typical screw spacing is 16” o.c. (on center) for walls and 12” o.c. for ceilings, but be sure to follow all appropriate local building codes regarding screw type and spacing. Make sure to stagger seams between layers. Once the dryall is fastened in place, the Green Glue will squeeze into a thin layer (about 0.5 mm). The second layer of drywall must be hung and screwed within 15 minutes of applying the compound to prevent the Green Glue from drying out. Use acoustical sealant to seal cracks and seams as well as the 1/4" gap around the drywall perimeter. Allow the Green Glue to cure for at least 2 weeks before testing performance. What is Green Glue & how does it work? How does constrained layer damping work? How is Green Glue applied? Can I use Green Glue with only one layer of drywall? Do I use nails or screws in conjunction with Green Glue? Should I use conventional adhesive along with Green Glue? How thick is the Green Glue layer? Can Green Glue be used in floors? Can I treat just the ceiling, or should all surfaces be dealt with? Can Green Glue make a high performance wall without decoupling? Can Green Glue be used in conjunction with decoupling techniques? Will Green Glue perform even better in between drywall and soundboard? How does Green Glue compare to other techniques? Is Green Glue a fire hazard? How much does Green Glue cost? I need to soundproof on a budget, how can I reduce the cost of a Green Glue room? 1. What is Green Glue and how does it work? Sound travels as a wave through the air. It's an airborne vibration. The waves hit a wall or ceiling and the energy becomes structure-borne. Unless the wall or ceiling material is damped, the vibration will travel through the building framing and exit somewhere else as sound again. 2. How does Green Glue Work? sandwiched between two layers of drywall. Damping occurs when the viscoelastic center of the "sandwich" is sheared (see below). When bent, shear forces pull and stretch on the damping material. Under these conditions, the unique polymeric construction of Green Glue very efficiently converts this mechanical energy to heat. The vibration energy is not isolated, it's dissipated and gone. Green Glue comes in 29 oz. tubes. You can use any quart size caulk gun, available at most hardware and building material stores. It is very fast and easy to apply. No special skills whatsoever are required. Application Instructions. 4. Can I use Green Glue with only one layer of drywall? 5. Do I use nails or screws in conjunction with Green Glue? Yes. Audio Alloy recommends the use of screws in accordance with local building codes. Screws assist with the compression of the Green Glue layer into a thin film. 6. Should I use conventional adhesive along with Green Glue? No. The presence of rigid, low-damping materials alongside Green Glue between layers is not desirable. 7. How thick is the Green Glue layer? 8. Can Green Glue be used in floors? Absolutely, in fact when used in floors, Green Glue yields a double benefit - it helps with both impact (footstep) noise and airborne sound, and is very effective at both. Green Glue may be used between layers of subfloor, between subfloor and tile backer board, and between thinset mortar and the surfaces below. You may be able to use 2 layers of thinner subfloor if convenient. 9. Can I treat just the ceiling, or should all surfaces be dealt with? If you have a situation where you want, for example, to stop sound from moving upstairs, the most logical path for the sound is through the floor/ceiling into the room above, this is called the direct path. However, sound can make its way upstairs through the walls (or even floor) as well in the form of mechanical vibration. Sound in your room vibrates the walls, this vibration makes its way up where it creates sound by vibrating the surfaces of the upstairs room. Sound making its way through these indirect paths is called flanking noise. An analogy that is sometimes used when discussing sound isolation is that of an aquarium. If your aquarium has a hole in any of the 5 sides, then the water can spill into the floor, regardless of how tight the other 4 are. The same applies to sound. For best results, you should consider treating all the surfaces of your room. You may also have to pay attention to other sound paths, such as noise going in and out of doors, and noise making its way through ductwork. Read more about how sound can travel along non-linear paths. 10. Can GG make a high performance wall without decoupling methods such as resilient channel? Yes, without a doubt. In fact, Green Glue has performance advantages in many applications relative to some decoupling schemes. 11. Can Green Glue be used in conjunction with decoupling techniques? Yes, and better performance can be had. For walls the preferred decoupling methods are double studs > staggered studs > modern sound clips > resilient channel. For applications where low frequency isolation is important, resilient channel is not recommended. 12. Will Green Glue perform even better in between drywall and soundboard? No. Soundboard is far lighter than drywall and isn't preferable in any ceiling or wall assembly. 13. How does Green Glue compare to other techniques? We have same-lab, 3rd party data answering this question directly. See our technology page for the details. 14. Is Green Glue toxic? No. Green Glue is water based, non-toxic, non-carcinogenic, and very low in VOC (<5grams per liter / compliant in all 50 states and worldwide). As with all products, paints, glues, and so forth, you should use proper precautions and read the MSDS before using Green Glue. Green Glue has a mild odor, typical of latex products. This odor is not dangerous and will dissipate completely given time. 15. Is Green Glue a fire hazard? No. Green Glue has been fire tested, and can be utilized in fire-rated walls without affecting the rating of the wall. 16. How much does Green Glue cost? About 80 cents per square foot, making a layer of Green the most economical sound isolation product around, as well as one of the best. 17. How much do I need? Recommended application is 2 tubes of Green Glue per 4' x 8' area - 2 tubes per standard sheet of drywall. If you are not on a budget, utilizing 3 tubes per sheet will improve performance. Each case of Green covers about 192 square feet, or 128 square feet if used at the 3 tubes coverage rate. Do not use more than 3 tubes per 4' x 8' sheet as performance will actually decline above 3 tubes per sheet. You are just wasting your money! 18. I need to soundproof on a budget, how can I reduce the cost of a Green Glue room? Wonderfully, Green Glue performs at an only slightly lower level if you use it at 1.5 or even 1 tube per sheet instead of the recommended 2. about 70% of the raw damping performance is retained when using 1 tube per sheet, 3rd party tests coming soon. In fact, Green Glue can improve performance if used at even less than 1 tube per sheet.